Here's another from the ever-growing untried stash, Kleancolor Spontaneous (#104). I purchased some Kleancolor shades last July, so this one is way overdue! I don't see Spontaneous on their site anymore, so my hoarding has paid off--it's now very rare and discontinued--I seriously doubt that! I used 3 coats and the application and drying time was just fine. This is an interesting shade that is mainly a bright gold shimmer. 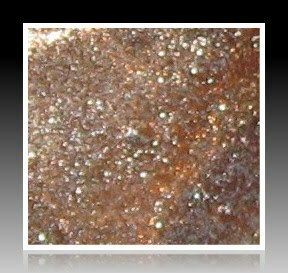 I would hesitate to say it's a glitter, because the pieces, although less refined than a typical shimmer, are not standing out to me as individual pieces. You can see the pieces in the macro photo above, but it's as if they're all melded together, and there's even the slightest hint of copper and silver mixed in. Almost like a molten gold. I'm having a difficult time explaining the finish on this one (you think?!! ), but I rather like it. If anyone else has this shade, I'd like to hear your more coherent thoughts! I have never heard of this brand before. I love this color though! This needs to be an eyeshadow. NOW. Silhouette Screams and I are thinking similarly. The finish really reminds me of a beautiful shadow or pigment. It looks shimmery and powdery somehow. This reminds me of OPI's DS Glow. I just had it on the other day and I couldn't explain it either. 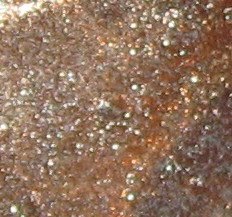 Maybe I'm not right on the color but the three shades of shimmer together remind me of Glow. Gorgeous whatever it is. Bella Sugar Cosmetics~I think they can be found in some stores/salons also, but I just order online. Cherry Culture carries them also. SilhouetteScreams~now that would be beautiful! Diana~Bella Sugar, are you reading these comments? We'll expect to see this from you soon~ha-ha! Lucy~I understand your thoughts. And yes, whatever 'it' is, is gorgeous!